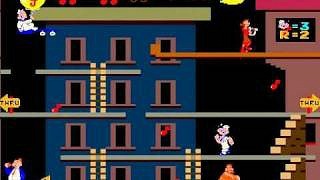 Popeye was a platformer that was originally released into the arcades and on the NES by Nintendo in 1982. However, in the UK and Ireland the game was licensed to Atari who released the game using their own cabinets. The game was ported to the Commodore 64, Atari 8-bit home computers, Atari 2600/5200 consoles, Intelivision and Colecovision to name but a few. 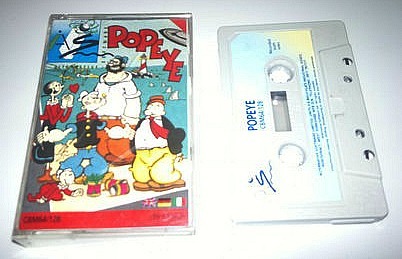 The idea of the game is to try and win Olive Oyl's love. She can be found dropping tokens of love from the top of the screen which Popeye needs to collect. There are many obstacles to avoid including Brutus, but collect some spinach and Popeye can knock him out, temporarily. Comparing the C64 and Atari XL/XE version, the C64 version looks slightly better in the graphics department (the love hearts look more like hearts, for a start!) but the animation of the characters definitely looks better to me on the Atari version - see what you think!